Striving for realistic immersion is every home theater enthusiast’s end game, and if you’re like me, you’ll go to extremes to find it. Modern technologies allow for exacting room optimization, a dynamic large screen video system, dazzling immersive sound, and bass that can pop nails in drywall – all of which are essential pieces to the puzzle. But a fun side to the hobby is finding a unique add-on that heightens a particular dimension of the overall home theater experience, especially if it can be done on the cheap. For my money, going the do-it-yourself route and installing a bass shaker system more than fits the bill. 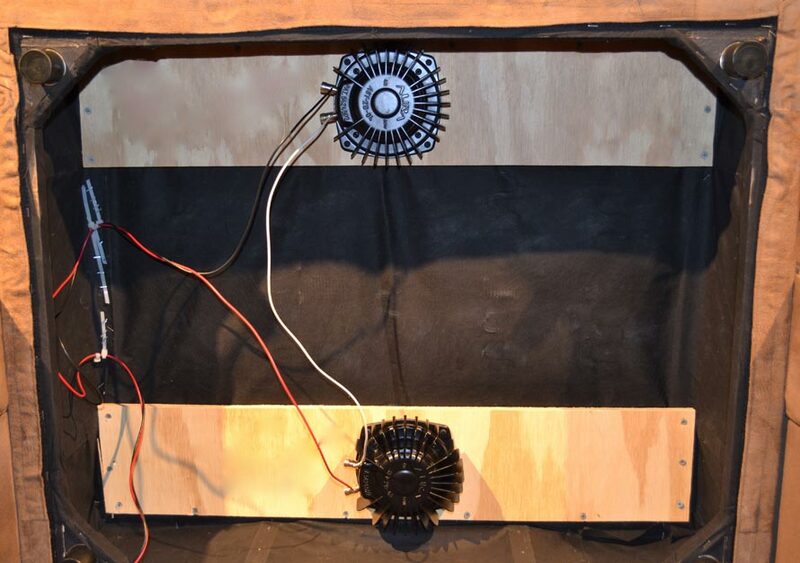 Before digging into the world of bass shakers (aka tactile transducers), I’m compelled to mention the absolute best way to introduce bone-rattling tactile sensations into your room is through the use of a subwoofer (or, better yet, subwoofers). Nine times out of ten, a properly sized and equalized subwoofer system will get you where you need to go. Truth be told, my dual subwoofer arrangement delivers more than enough power and oomph to send thumps, thuds, and vibrations straight through my theater room’s seating. Bass shakers simply enhance the tactile attributes of the lower-end while adding quite a bit of punch that can be felt right in the seat of your pants – literally. Believe it or not, that kind of direct placement of deep bass power can bring you that much closer to realism. Alternatively, shakers can be used to inject the feel of bass in situations where a subwoofer system lacks proper power or is being played at lower volume levels. There are a number of bass shaker brands on the market, including models made by Reckhorn, Earthquake, Clark Synthesis, Buttkicker, ADX and AuraSound. Buttkicker, Earthquake, and Clark Synthesis all make products that lean toward the more expensive side of the equation; you’ll typically find models from these manufacturers selling in the $150-$600 dollar range. ADX falls in a price range just below the $150 mark, while both Reckhorn and AuraSound offer models that can be found for $65 or less. Here in the United States, Clark Synthesis, Buttkicker, and AuraSound are the most prevalent brands on the market, while our European friends have better access to the likes of Earthquake and Reckhorn. Like anything in this world, the more you spend, the more you’ll get. The most expensive shaker models deliver more thump, have wider usable frequency spectrums, and can handle more power. The Clark Synthesis Platinum model is one of the most powerful shakers on the market, offering a functional frequency response range of 5 Hz to 17 kHz and output power that trumps other available models. On the other end of the spectrum is a shaker manufactured by AuraSound. The Pro Bass Shaker offers less in terms of dynamic performance, but delivers more than enough shake to make it easy to recommend. AuroSound’s Pro Bass Shaker is marketed for a range of applications, including video game cabs, cars, and theater seating. It can be readily purchased from Parts Express and Amazon for less than $50 (sale prices dip as low as $35 per unit). With a power rating of 50 Watts (4 ohms), the Pro Bass Shaker might be weaker than other options, but it’s cheap enough to buy in multiples to increase impactful power. It has a usable frequency response of 20 Hz to 80 Hz and uses an internal voice coil to deliver 30 lbs. of max force. Due to its reasonable size (6.2-inches wide, 2.5-inches tall), it’s easy to place within furniture. From my perspective the Pro Bass Shaker’s limited frequency response is far from a handicap. While some users might appreciate a more expensive model’s ability to create a tactile response from higher frequency information, I’ve found that any kind of vibration resulting from information above 50 Hz begins to intrude into the realm of dialog; it’s a bit odd when the low-end of throaty voices finds its way into your chair. You need to think of shakers as small subwoofers that require outboard amplification. In other words, you need to feed them power. Quite a few premium brands (such as Buttkicker) sell packaged systems that ship with a dedicated amplifier unit. However, if you’re going the do-it-yourself route, you’ll need to get creative. 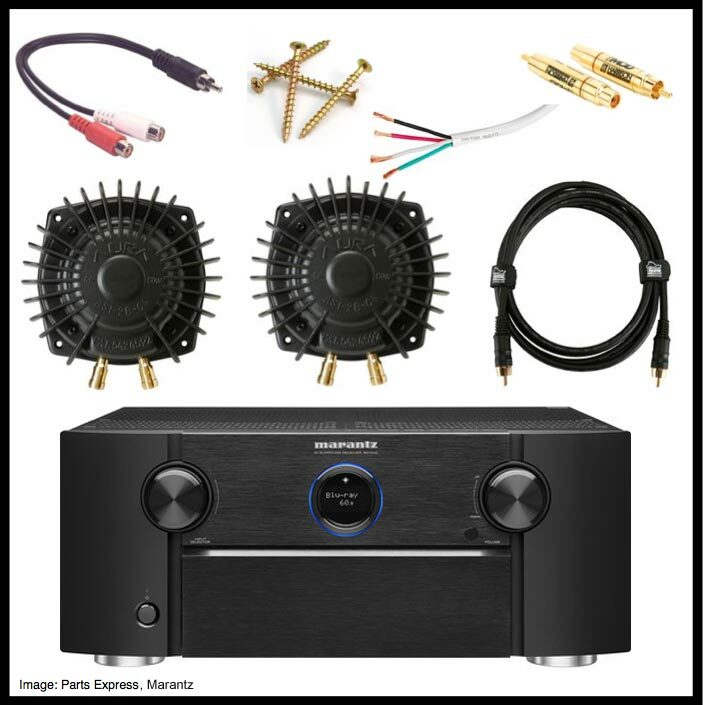 Options include using a subwoofer plate amp (e.g., Dayton Audio’s SA70 70 Watt Subwoofer Plate Amplifier), an old AV receiver or amplifier, or a new receiver or amp. During my install, I reached for a used Pioneer Elite VSX-21 THX receiver I had on my bench. An AVR has several advantages, including an independent volume knob that allows you to easily vary output intensity. Whatever your choice, if you go the AuraSound route, you won’t need to source a tremendous amount of power to get great effect. Anything capable of producing 70 Watts or more per channel should get the job done. My theater seating consists of a modular couch system that has three large seating surfaces. I opted to buy two Pro Bass Shakers per seating section of the couch; experience tells me that I’d still dedicate two shakers per seat if I were outfitting chairs with smaller seating surfaces. You can find most of these parts at a supplier such as Parts Express. Installation might vary based on the kind of receiver or amplifier you use, but the following are general guidelines that should apply to most applications. In order to split the low frequency signal, plug the RCA Y-Adapter into your primary AV Receiver’s Subwoofer Out. Plug the subwoofer’s cable into one side of the splitter and the new RCA cable into the other. Insert the 50 Hz Low Pass Filter into the “Subwoofer In” input on your bass shaker’s amp and plug the new RCA cable into the filter. If you’re using a plate amp, then you might need a second splitter to connect the LFE cable to the left and right low-level inputs on the plate amp. In this case, put the low pass filter in-between the RCA cable and the second splitter. In order to install the Pro Bass Shakers, you’ll need to gain access to the underside of the your seating. The shakers need to be firmly mounted using all four-screw holes present on the housing of the shaker, with the bottom-side facing upward into the seating surface. This is a key point of emphasis: If you want the most tactile response, then mount the shakers facing in the “bottom side up” position. If your couch or chair has bracing or a solid surface that allows for this orientation, great. If not, then you’ll need to cut and install a bridge-board made from solid wood or plywood. Simply screw the bridge-board into the bottom of your chair and mount the shaker on the board. My installation required the latter, and was easily achieved with a few quick cuts and several strategically placed screws to hold it into place. Once the shakers have been installed, make sure that all screws (on the bridge-boards and shakers) are tight. Pro Bass Shakers have an impedance of 4 ohms, therefore you’re best option is to wire them in series (if installing in pairs), which creates an 8 ohm load that most amps can easily handle. 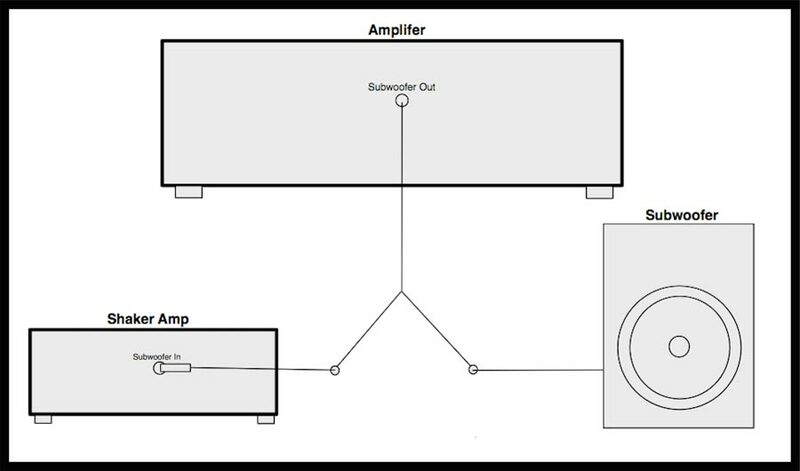 For a single bass shaker, simply run speaker wire from the positive terminal of the amp to the positive terminal on the shaker (and negative to negative). 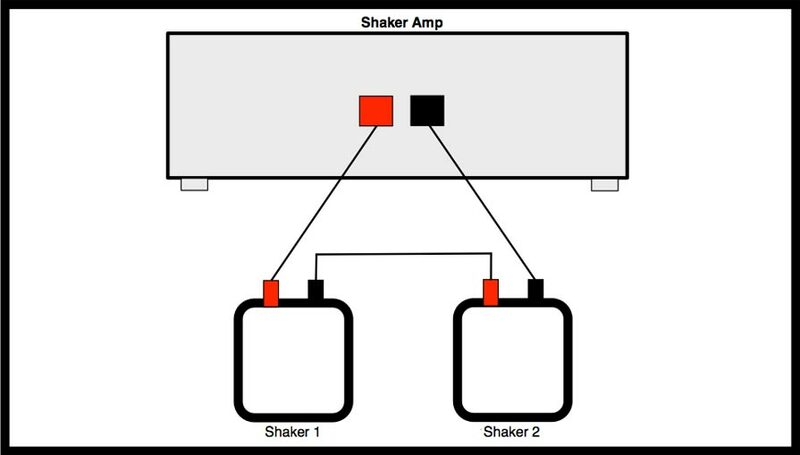 For two bass shakers, connect the positive of one bass shaker to the negative of the other bass shaker. Next, connect the unused positive and negative terminals on the bass shakers to the corresponding positive and negative terminals on the amplifier. 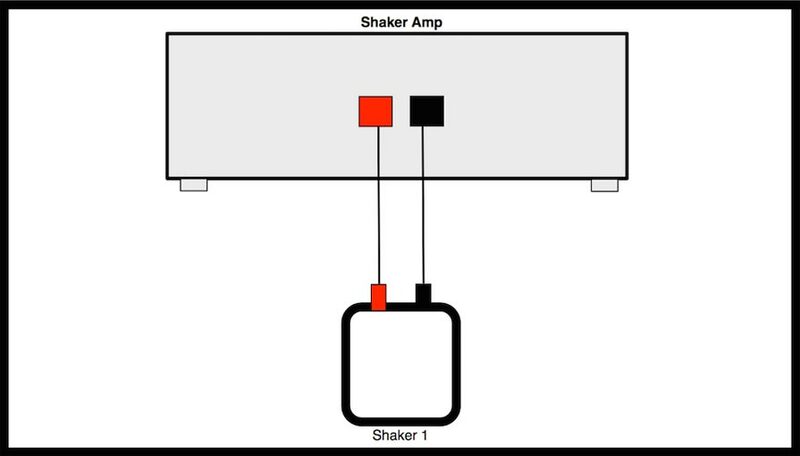 Repeat this process for the other bass shaker pairings, only connecting one speaker wire to each terminal on the backside of your amp. Once the shakers are installed, you’re ready for action. Definitely consider decoupling your couch or chair from the floor using rubber feet or another type of isolation product. Proper isolation will help to keep the shake in your seat as opposed to dispersing it into the floor. You’ll need to experiment with volume output on your shaker amp if using an AVR (you might find that too much volume will cause your AVR to trip and turn off during heavy bass playback). Aside from that, sit back and enjoy the rumble!